Before developers began making online slots, they used to manufacture real, physical slot machines. These were big machines, over 6 feet tall, and had buttons, flashing lights and spinning reels! Back in the day, you used to be able to go to a games arcade and actually insert real coins to play these old-school slots. Some pubs and bars also had slot machines, as did many casinos. In fact, you can still play on real slot machines at casinos all around the world! 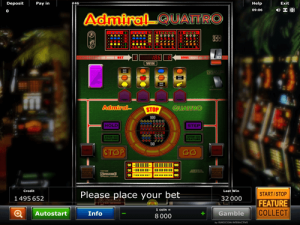 Admiral Quattro is different to many online slots made by Novomatic, or anyone else for that matter. The design mimics a standing slot machine, and you can see the whole face of the machine instead of just the reels. Admiral Quattro is one of many machines inside this retro arcade. It’s a very colourful slot machine. The background is green and there are many buttons and other things that light up. It looks quite confusing when you first see it, but actually it’s a simple game to play. It has four reels and only one payline. However, it does have a couple of features that make the game more interesting! Admiral Quattro is theoretically a good game for beginners but you might want to play once you are familiar with slot games, only because it looks a little complicated and the rules aren’t exactly very normal. Novomatic are well-known for making these types of online slots that are like Admiral Quattro. Joker 5000 Wild, Dice Winner, Club 2000, Gold Runner and Joker 2000 are just a few examples. Admiral Quattro has many symbols and they are all very famous! If you play slot games, or you’ve ever seen one before, you’ll recognise the symbols immediately. There’s nothing unfamiliar about what you’ll find on the reels of Admiral Quattro! There are cherry symbols, orange symbols, pear symbols, watermelon symbols, lemon symbols, strawberry symbols, plum symbols, bell symbols and star symbols. There are also bar symbols, which come in single bar symbols, double bar symbols and triple bar symbols. At the top of the slot machine, you can see the paytable. If you want to view a bigger version, you can go to the paytable. The four reels in the middle of the slot machine have one payline, which goes across horizontally. If the reels stop with matching symbols (as shown on the paytable) on the payline, you will be awarded the appropriate payout. The cherries, for example, give payouts for one, two or three matches in certain positions. Other symbols in the game can give wins for matches of three or four identical symbols. Bets and wins are calculated in coins in Admiral Quattro. You can set the value of a coin to whatever suits your budget. Every spin costs 1 coin and payouts vary, depending on the symbol and the number of matches. Admiral Quattro has several bonus features which add some excitement to this otherwise simple Novomatic casino game. These features aren’t new, they have been seen on Novomatic slot games before. However, not like this! Normally, with bonus features such as those in Admiral Quattro, you can choose when to use them! However, in this fruity slot game, the bonus features are activated randomly and they won’t always be available on every spin. When the Hold feature is available, you can hold a reel in place and keep it fixed for the next spin. When the Nudge feature is available, you can use it to move a reel forward one position or ‘nudge it down’ to hopefully get a more favourable symbol in its place! Admiral Quattro also has a Mystery Roulette feature. This exciting and high-paying feature can be triggered when you get a big win! This extra game is played on the roulette wheel underneath the reels. There are two buttons ‘Stop’ and ‘Go’ which do the obvious, of course! Depending on where it stops, this feature can earn you up to 100 coins! You can gamble any win you receive in Admiral Quattro. What’s more, as is typical for Novomatic, you can play Admiral Quattro automatically.